Twenty-four pounds of butter, plentiful pounds of walnuts, almonds, and pecans, dozens of eggs, ginormous gobs of Ghiradellis, so many sacks of sugar, Kisses and Hugs, lemons and cherries and apricots oh my! 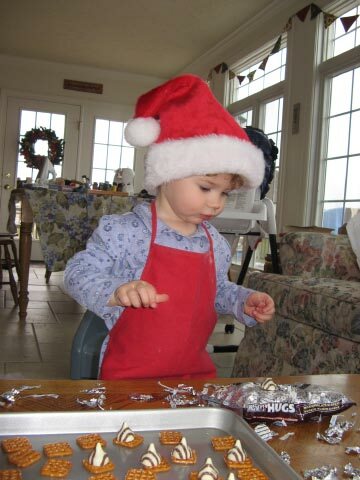 In the weeks leading up to Christmas it was delightful to read the different blogs and peek into the kitchens to see busy elves young and old and the treats they were preparing for the holidays. 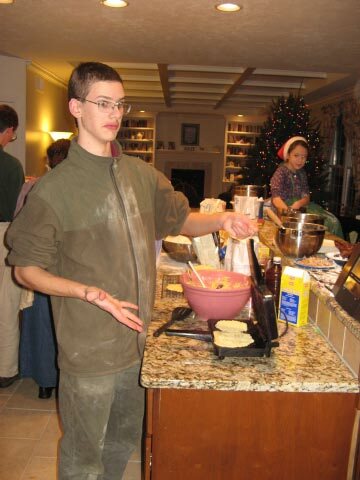 We do our baking a little bit different here - we do all of our baking in a two day marathon in which everyone works together to make lots and lots of cookies. We bake a couple dozen varieties and then use them for our gifts for special friends and godparents and music teachers and so forth. This is Tradition with a capital T around here. 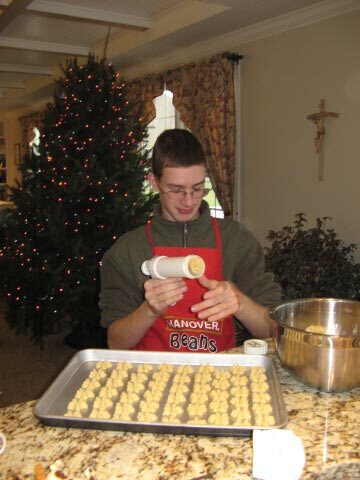 I can remember baking Christmas cookies with Michael in the tiny dorm kitchen so many years ago, and we have baked cookies together every year since. 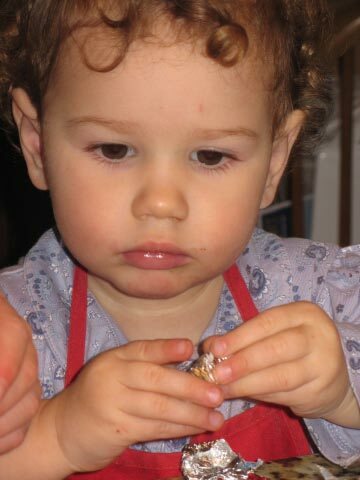 Some years I have mostly directed while lying green on the couch, some years I have baked with a baby on my back (I still remember a little Josiah sneaking his pudgy fist into the chocolate without my knowing it and smearing it all over me), but We Always Bake Cookies. Lots of them. The variety of cookies, who does what, the music we listen to while working, the dinner break for pizza, the counting and documenting, all the way down to the hats and aprons - this is Tradition. It's a very important part of our Christmas family culture that we look forward to every year. Ever since we bought this house we've been anticipating the joy of cookie making in such a spacious kitchen with two ovens. It was a pleasure to have lots of room to work. Even the youngest toddler has important (and Traditional) jobs to do. One of these is to soften the butter. 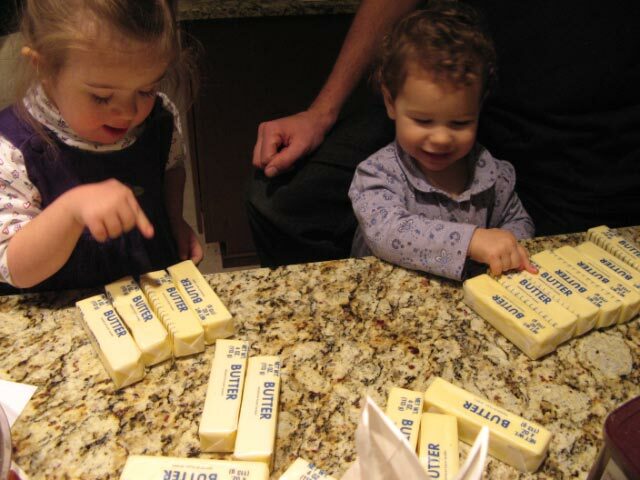 They build houses and towers and have a great time warming up the butter sticks. 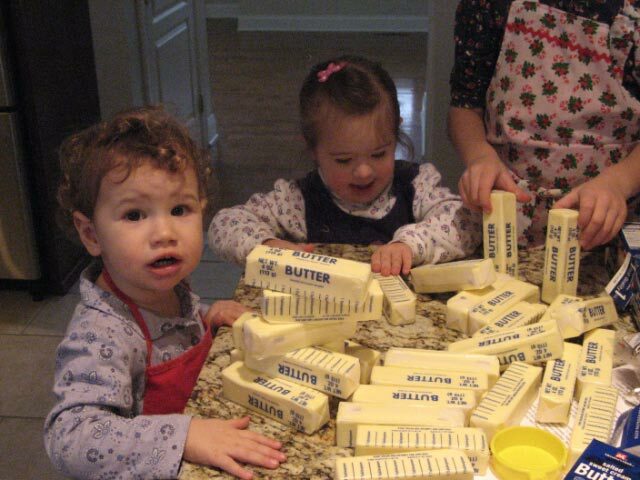 It's also fun to count the butter. 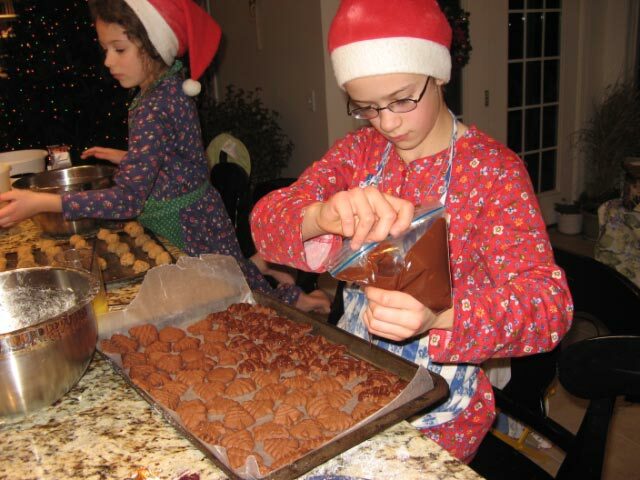 Kateri had a good time putting the Hugs on the pretzels for these super easy treats (thanks Donna!). You simply pop your Hug-topped pretzels into a 275 oven for about ten minutes, then top each softened Hug with an M&M. Teamwork is required to quickly get the M&M's pressed into the just-melted Hugs. Fine motor skill practice is always fun when you get to unwrap all of the Kisses for the Kiss Bombs (These are technically called Peanut Butter Blossoms but it's much more fun to call them Kiss Bombs). but he always triumphs in the end. Lydia always drizzles the chocolate spritz trees with (what else?) more chocolate. 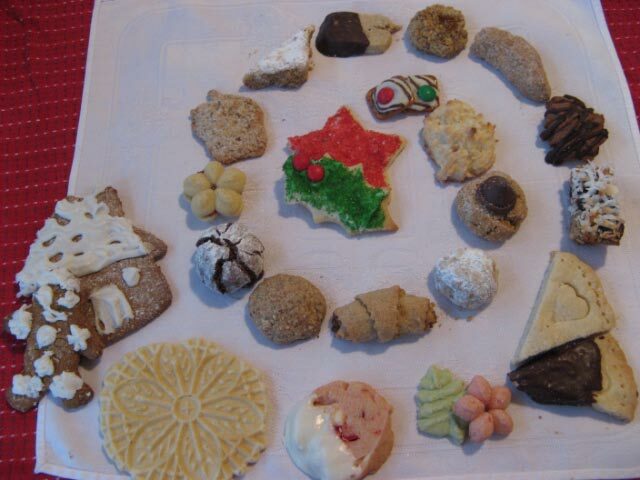 We have a long list of cookies that we make every year but I also like to try a new recipe or two for variety. This year one of the newbies was White Chocolate Cherry Shortbread. 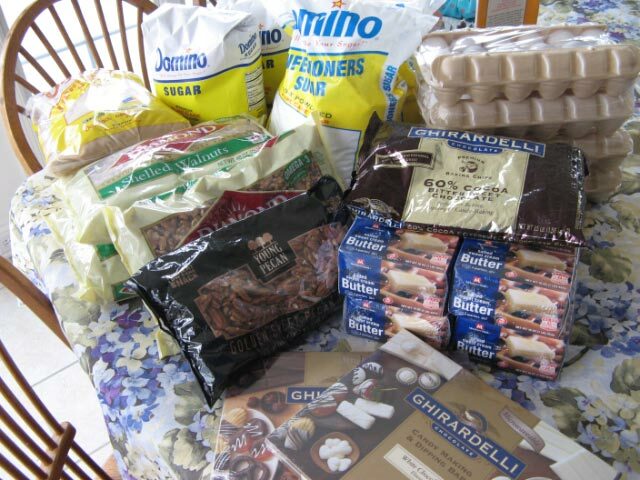 We had actually finished all of the baking and then I found these linked on Heather Bailey's blog. One look at these pretty pink treasures and I was smitten. Cherry and almond are two of my favorite flavors - so perfect together and with white chocolate to boot. My ever-patient dear husband ran me by the grocery store after morning Mass just to get some cherries. True love (with a cherry on top). I simplified the prep of course: Just mix them up by hand like regular shortbread, quickly (not five minutes!) and gently (hence the term short), adding a bit of cherry juice to hold the dough together. I just shaped the dough into logs (three logs for a double batch), chilled them a bit and then sliced them. Infinitely easier than the shenanigans originally called for in the recipe. I also just microwaved the chocolate according to the package directions. These very pink cookies would also be nice on Valentine's Day. 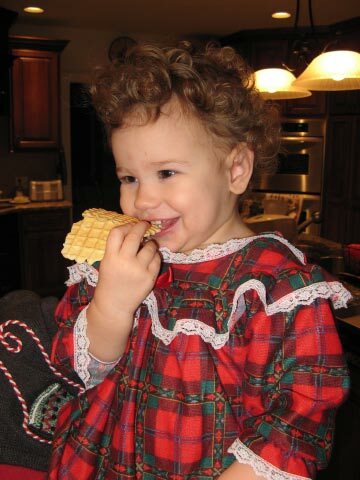 Josiah always makes the pizzelles. I just use the recipe for Italian pizzelles that came with my VillaWare V3600-NS Prego Nonstick Pizzelle Baker. Kateri appreciates the fruit of his labors. It is also Tradition to make the Hungarian cookies called piskota late at night. There are always over two hundred of them, and each one is brushed with egg white and then dipped in walnuts before baking. 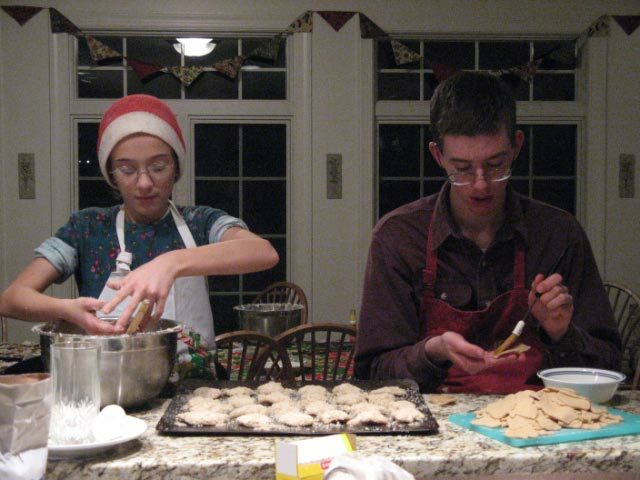 This always involves Jonathan and a hardworking sister and the pair can get downright punchy after so many cookies. 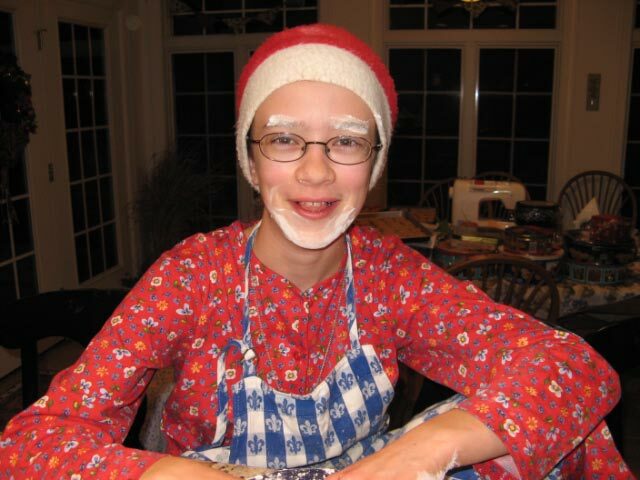 Lydia has aged quite a bit after making so many cookies. No one eats many cookies during baking days, but when they are all done the fun starts and the tasting and sampling begins in earnest. Here the girls are enjoying a late night snack on Christmas Eve. 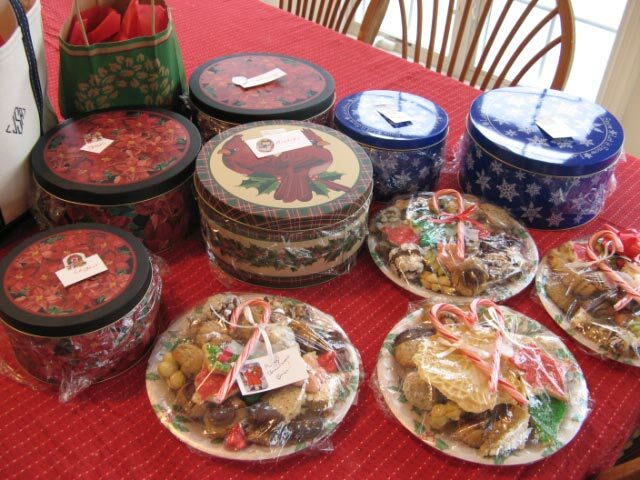 Here are some of the plates and tins made up to give as gifts. 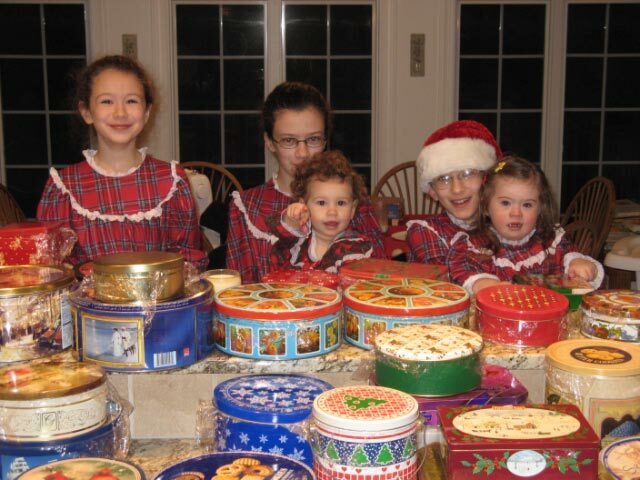 This year's grand total : 2,823 cookies. That's a lot of tea parties. 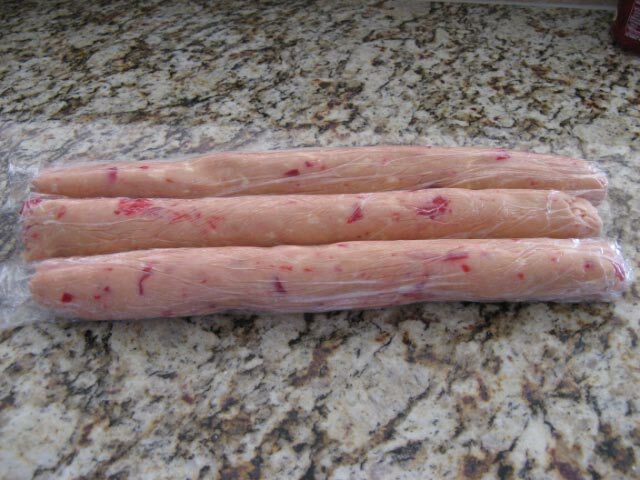 Use butter and cheese at room temperature for easier mixing. In a very large mixing bowl, stir baking powder (and salt if desired) into flour. Mix in butter, cream cheese and vanilla. You can knead it all together with your hands or use a heavy duty mixer as it is a stiff dough. If you must refrigerate the dough before using it, you will have to let it warm up a bit or you won’t be able to roll it. Roll dough out to approx. 1/8 inch thick. This much dough makes appox. 200 piskota. Combine cheese, butter and flour. Mix together well with your hands or a heavy duty mixer. Wrap dough in plastic wrap and chill. I usually double this recipe to make 128 cookies. Mix all ingredients together. Chill dough. Roll out and cut with cookie cutters. Bake in 350 preheated oven approx. 7-10 minutes. They are done when they are just beginning to get golden underneath and on the edges. When cool you can frost them with powdered sugar frosting (For a double recipe of cookies use 1 stick butter, 1 tsp. vanilla, approx. 4cups powdered sugar, and milk as needed -beat until smooth) then sprinkle with colored sugars. Or you can spread their bottoms with melted chocolate (melt chocolate chips in the microwave with a tsp. of shortening – stir until mixed). This recipe is good for any holiday shapes - hearts for St. Valentine's Day, shamrocks for St. Patrick's Day, flowers and such for Easter, etc. 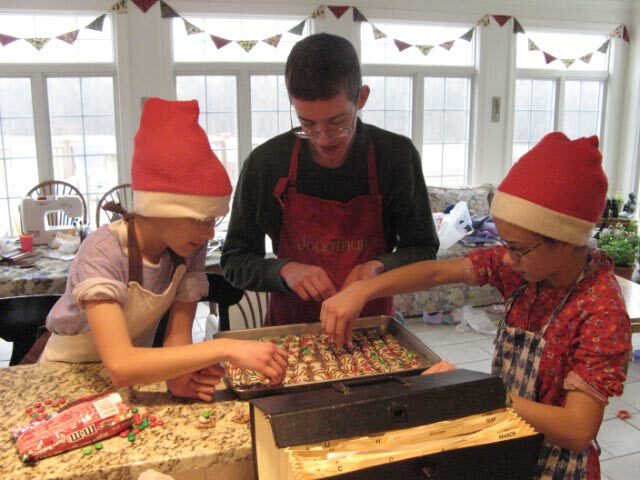 I love to bake and we do quite a bit, especially around Christmas, but NOTHING close to the magnitude of your family. This looks like so much fun!!! What a wonderful tradition. By the way, that is a spectacular drawing by your daughter. The daisies are magnificent. She is quite an artist! 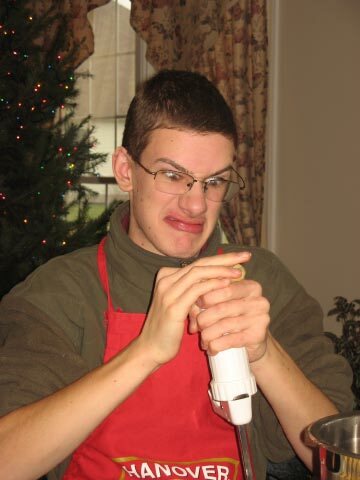 Kimberlee, how does Josiah get the cookies off the press. I had a Pampered Chef cookie press I got rid of a few years ago because the cookies would never drop off the press. Scraping them off, no matter how sharp the knife, always yielded blobs of dough, not pretty designs. I would love to buy another one if I knew the trick to releasing the cookie in a pretty fashion. Gorgeous cookies and what a lovely header photo! That's a really neat tradition. It looks like your children enjoy it. The cookies look scrumptious. That looks like so much fun and the cookies look mmm mmm good. What fun memories you are creating.